With some lawmakers chanting “Death to the America,” Iran’s parliament voted to ban access to military sites, documents and scientists as part of a future deal with world powers over its contested nuclear program. 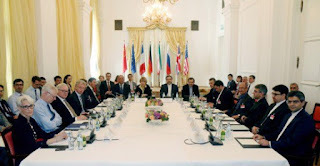 The bill, if approved into law, could complicate the ongoing talks in Vienna between Iran and the six-nation group – the U.S., Britain, France, Russia, China and Germany – as they face a self-imposed June 30 deadline. The talks are focused on reaching a final accord that curbs Iran’s nuclear program in return for the lifting of economic sanctions. Of 213 lawmakers present on Sunday, 199 voted in favor of the bill, which also demands the complete lifting of all sanctions against Iran as part of any final nuclear accord. The bill must be ratified by the Guardian Council, a constitutional watchdog, to become a law. The terms stipulated in the bill allow for international inspections of Iranian nuclear sites, but forbid any inspections of military facilities.